The Spring/Summer 2017 Hera Seoul Fashion Week will kick off Oct. 17 at Dongdaemun Design Plaza with an opening reception honoring designer Han Hye-ja, the visionary behind Korean couture brand HANEZA. In fact, creating and maintaining an archive of Korean fashion is a new goal for Seoul Fashion Week under Jung, who was appointed to the position last May. Seoul Fashion Week, in collaboration with Google, is to open an exhibition that looks back at the growth of fashion in Korea in December. Another big task at hand for Seoul Fashion Week is to continue garnering the interest of major players in the global fashion world. Currently, there are some 70 writers from renowned global outlets, such as Vogue Paris, Vogue US, CNN and W Magazine, scheduled to attend the annual event. Such international media coverage has a great impact, because the foreign media outlets utilize social media platforms to live-stream the shows and make the event accessible to everyone. This is an absolute necessity for the fashion industry in the digital era, according to Jung. 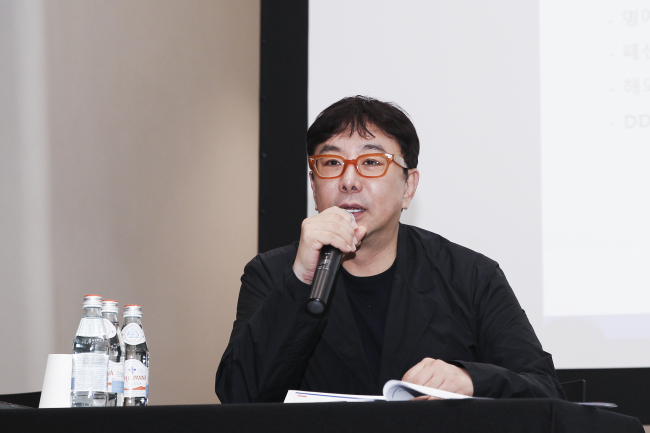 The biggest change Jung -- former creative director of Cheil Industries -- has witnessed over the years is the eagerness of foreign buyers and press to attend Seoul Fashion Week, which was once brushed off in the fashion scene outside of Asia. Some 200 foreign buyers are expected to attend the latest edition. To create and increase the hype around Korean fashion, Jung has been working with leading merchandisers worldwide to set up pop-up stores in major European cities, including Paris and Milan. Next January, Selfridges in London will be hosting a monthlong pop-up event featuring collections from 10 Korean designers. Forty-one designers and six national brands are participating in the upcoming fashion week, taking place at DDP from Oct. 17-Oct. 22, while 100 up-and-coming designers will be showing at the Generation Next Seoul trade show. This year’s event will conclude with an award ceremony celebrating the best of veteran and emerging designers. For more information, visit seoulfashionweek.org.